A picture is worth a thousand words, but is it worth ten thousand miles? I am talking about a particular image, and ten thousand very real miles of travel. 10,000 miles for a smile. These Khori Buryat girls are on their way to parade into the stadium at the opening of Altargana 2014, in Dadal, Mongolia. The careful student of math will conclude I travelled 10,169 miles. Of these, the last 365 were by far the hardest, and that is where we will pick up our story, in the teaming streets of Ulaanbaatar, a capital city, a boom town. Right now it is flush with three things, no four. Mining money, Toyota Priuses (seriously, I am seeing them lined up three in a row at traffic lights! ), pregnant women, or recent mothers, and newly rising high rises. Into the hushed pre-dawn of the city I stepped, backpack on my back, camera gear on my chest. I made my way to the 5 am rally point where I would travel with the Buryat Community of Ulaanbaatar to Altargana 2014. If you don’t know what Altargana is, read my post on it from 2010 by clicking here. 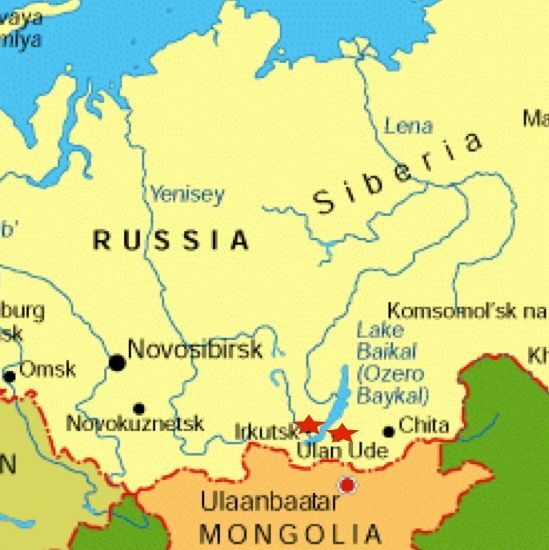 What you should be thinking, although you may not know it is: “Alex, how do you know the Buryat community in Ulaanbaatar? You spend most of your time in Ulan-Ude.” Well I don’t, that is, I didn’t. Nope, I just called them up from Montana, and asked if I might go along. Let’s be clear here, I called some number I found on the internet connected with a Mongolian site about Altargana 2014. The man who answered spoke some English, and some Russian, and we kind of communicated. Kind of. With whom did I speak? I assumed it was some young man whose job it was to help people find their way to Altargana. And you know what they say about the word assume. So, here is this red-bearded Montana kid appearing from among the silent high-rises to select a spot among the gathering Buryats. This was certainly a mysterious turn of events for them. The ice breaker came when little Saruul, a mischievous young man, with a gifted set of pipes, decided to take a recon run by me, since I already grinned at him, oh! and my red beard has mesmerizing powers. He rounded up his chubby partner in crime Shineft, with an equally nice vocalisation skills, to swing by me for a closer look. We all laughed and that sealed the deal. The rest of the Buryats continued about their business, now sure that I was OK.
Our five o’clock rally point continued to be our rally point through six, seven and eight. Eight thirty was our ticket out of the city and into the boundless Mongolian steppe. Two Soviet Buses rounded the corner to round us up, and the expedition was on. Oh Mongolia! Your beauty is unsurpassed. Four elbows in the grease. This is episode # 1. As we tooled out of the city, the question “Sasha, do you drink Kumis?” was flung into the buses atmosphere. Kumis, fermented mares milk has a savory tang to it, and is a taste one acquires among nomads, one I had acquired years past. “Certainly.” Was my response, and soon a jug of the slightly alcoholic milk beverage found my place. I took a few swigs, glad that in some way my cultural immersion was paying off. In one short exchange I had become Sasha, which around here is short for Alexander, and payed respect to Buryat culture all in one swig. In a real sense, that made me one of the Buryats. Our first break down took place took place about two hours in. The Mongol mechanic got about his business, got a face full of oil, deftly cut hoses and had us back up and running in twenty. That was hopeful, I felt good about that, we were in good hands. Our second breakdown occurred let’s see . . . two more hours in. Now we are pulling stuff out of the buses engine I’ve never seen before. Oh well, the picnic is in effect. People be bustin’ out plastic-ware full of scrumptious stuff, and they are handing it around, cause they prepared to feed everyone, like they always do in this part of the world. And I’m making inroads with the ladies, you got to do that. The ladies are where it is at, and by ladies I mean the Matriarchs. If they have a low opinion of you, you can become persona non grata. But if the Matriarchs can laugh a bit, and see your earnestness to learn, then they will take care of you. This is not about pulling yourself up by your bootstraps, this is about finding your niche in the community and making a proper contribution. Mine became this: Recording every triumph and setback along the way. That, and being an interesting conversation piece. See, these people had been to festivals before, they knew all about being Buryat. But meeting a ‘Merican who is interested in what being Buryat means, that is unusual. So, I took pictures, made a few jokes, enjoyed their hospitality, and that made them happy. Bango! I am part of the community! You know what a relief that is? I don’t speak the language here (some of them spoke Russian, as I do), now I got people who will make sure I get a plate at the local cafe, I got people who will give me half of what they got. Really! These people are great! I mean it, really great. A Buryat patiently waits in his element. “The Matriarchs” gettin’ their game on. These ladies have their fingers on the pulse of their community, good friends to have. Meanwhile at the kids table they are keeping their cards close in this high stakes game of waiting as we deal with broke down episode # 2. L to R: Dorjderem, Bold, Otgoo, and Selenge. Bold and Saruul let their inner artists flow in the roadside dirt. This is already broke down episode # 3. We were on the road after a forty-five minute forced picnic. And I’ll bet we rolled for forty-five minutes before . . . I don’t even have to say it. Breakdown number three. Number three was a red-line. 50% of our fleet of Soviet buses down and out. The market for a new bus just opened up somewhere out in Khentii province. We made the call, and now are awaiting our replacement carriage. It’s origin point is Ulaanbaatar, a three or four hour mad-dash away from our present position. Saruul keeps us all entertained through silly antics, and an age-old game of hopscotch. Selenge rockin’ that nerdy cool vibe out in the Mongolian steppe. Selenge is named after the river “Selenge” or “Selenga” which flows north out of Mongolia into Buryatia right through Ulan-Ude into Lake Baikal. This stop was highlighted by hopscotch. Yep, nomads play hopscotch, who knew? We also drew in the dirt. My new friend Bold drew a seriously striking resemblance of the Montana kid with a roman nose and red beard. Me in dirt. We made our way up the road a bit to a settlement with a cafe. I wanted buuz, that is steamed meat dumplings (find out what buuz are by clicking here) but the joint didn’t have any. That is when Selenge, a young lass practicing her English with me, took it upon herself to go to a different cafe and order me as many buuz as I wanted. See what I mean? These people are awesome! Meanwhile my new friend Otgoo the mountaineer is feeding me half his plate of beef and noodles. Otgoo, who has peaked out on Mt. Elbrus four times if memory serves me. Otgoo, Buryat mountaineer from Dadal, Mongolia. Dadal may be bigger than Two Dot, Montana, but not by much, not by much. We play cards, a game called “fool”, still the game of choice in former Communist regions. I managed to not be the fool one time, a small triumph that I will take! Bayasal and Saruul having fun with rocks, one of our many forms of entertainment waiting for our replacement vehicle to come from Ulaanbaatar. Four-thirty, we’ve been sitting at least as long as rolling. The new mini-van is here, and we load our gear onto the top. My rucksack will be with one vehicle, while I’ll be on another. You do the math. Five O’clock and we are trundling across the steppe again. I’m still a long way away from making that first image you saw. And things are about to get complicated.